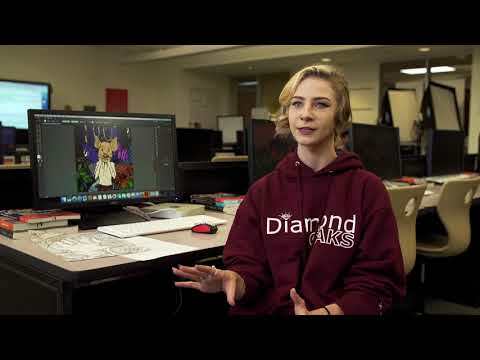 Connect to the Diamond Oaks Digital Arts and Design Facebook page! Connect to the Laurel Oaks Digital Arts and Design Facebook page! Connect to the Live Oaks Digital Arts and Design Facebook page! See samples of Live Oaks student work here. Connect to the Scarlet Oaks Digital Arts and Design Facebook page! Combine an artistic interest and computer skills. Create graphic art as well as videos, animation, and eye-popping posters and printed materials. You can learn the skills in the Digital Arts and Design program. Create, design, and produce print and multimedia images. Use Adobe Illustrator, After Effects, Premiere Pro, Photoshop, Animate, InDesign, and other computer applications to digitally generate media. Complete perspective and product drawings.